It’s something that lies close to his heart. 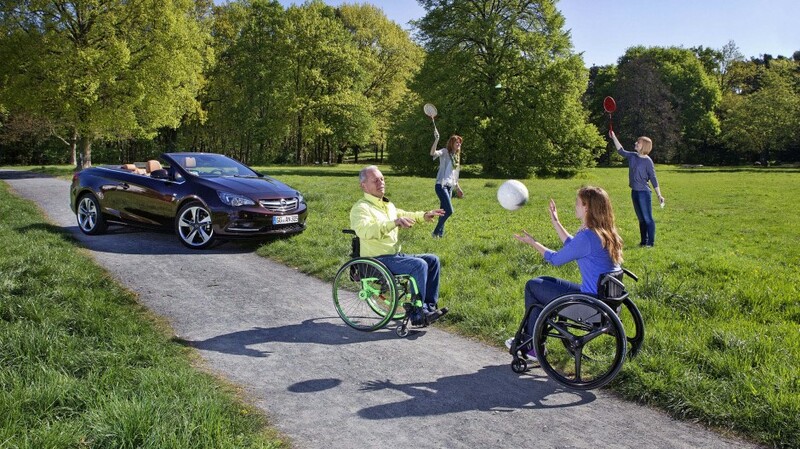 Reimer Völz and OSV (Opel Special Vehicles) are committed to making driving just as much fun for disabled drivers as for anyone else. To this end, the Opel engineer exchanges ideas regularly with the OSV team that is responsible for the technical implementation of the project. Here he can be seen with Marketing Manager Ilona Köhler. A practical solution: Thanks to a manually-operated control the driver can press the accelerator and apply the brakes with his right hand. For around six months now, Opel has been installing these mobility aids directly at the plant. Berlin conference: The “Re-Park in Your Head – Inclusion, Not Exclusion” panel discussion, which was held in the German capital, brought together Jan Burdinski, head of Opel’s Berlin office, Verena Bentele, the Federal Government Commissioner for Matters Relating to Disabled Persons, Thomas Pohl, Opel Integration Manager, Reimer Völz, development engineer at Opel, Lene Hodek, who hosted the conference and serves as a research associate in Labor and Occupational Rehabilitation at the University of Cologne, and Gustav Pruß, managing director of the German Association of Certified Disability Managers. To demonstrate the special equipment at trade shows and presentations, or when preparing promotional material, OSV made the conscious decision to use an Opel Cascada. This model like none other conveys a sense of “pure joy and excitement.” Reimer Völz is particularly pleased about this. Naturally, he is also happy to model for the photographers on such occasions. Engineer Reimer Völz, who himself uses a wheelchair, works with Opel Special Vehicles to find the best solutions for handicapped drivers. For six months now, mobility aids have been installed directly at the plant. Eine Herzensangelegenheit: Reimer Völz setzt sich gemeinsam mit OSV dafür ein, dass Fahrer mit Handicap genauso viel Spaß am Fahren haben können wie alle anderen auch. Dabei tauscht sich der Opel-Ingenieur regelmäßig mit dem Team von OSV (Opel Special Vehicles) aus – hier mit Marketingmanagerin Ilona Köhler –, das die technische Umsetzung des Projekts betreut. Praktische Lösung: Dank eines Handbediengeräts kann der Fahrer Gas und Bremse mit der rechten Hand bedienen. Seit rund einem halben Jahr baut Opel diese Mobilitätshilfe ab Werk ein. Berliner Runde: Bei der Podiumsdiskussion „Umparken im Kopf – Inklusion statt Separation“ trafen sich in der Hauptstadt Jan Burdinski, Leiter der Berliner Opel-Konzernrepräsentanz, Verena Bentele, Beauftragte der Bundesregierung für die Belange behinderter Menschen, Thomas Pohl, Opel-Integrationsmanager, Reimer Völz, Entwicklungsingenieur bei Opel, Moderatorin Lene Hodek, Wissenschaftliche Mitarbeiterin des Lehrstuhls für Arbeit und berufliche Rehabilitation, Universität zu Köln, Gustav Pruß, Geschäftsführer des Vereins der zertifizierten Disability-Manger Deutschlands e.V. Was Reimer Völz besonders freut: Bei Präsentationen oder beim Erstellen von Werbematerialien setzt OSV bewusst einen Cascada ein, um die Spezialeinbauten vorzuführen – einen Opel also, der wie kein anderer „Lebensfreude pur“ vermittelt. Klar, dass er daher auch gerne als Fotomodell agiert. Reimer Völz has been working at Opel for the last 30 years. Ever since a motorcycle accident 22 years ago, he has been paralyzed from the waist down. But his passion for cars is as strong as ever. An engineer in the Advanced Engineering department at the International Technical Development Center (ITEZ), Völz meets other people with disabilities all the time who feel the same way he does. He has a simple explanation for this: “Any handicaps one may have seem to disappear behind the wheel.” With just a few modifications, they can experience as much fun driving as people without disabilities. Reimer Völz oversees his department’s fleet of 18 cars, including several classic Opel models. In most of them, he personally installed the mobility aids. He would never give his blessing to possible new features or equipment without having put them through their paces himself. HOW DO YOU ADVISE A DISABLED BUYER IN THE SHOWROOM? He is often all the more surprised how people react when he comes into a showroom in his wheelchair. “In everyday life, I frequently notice that people are uncomfortable and have a hard time acting, well, normal around disabled people,” Völz says. Sales people are no exception here. “Sometimes they wouldn’t even approach me since they didn’t know what advice they could possibly offer me.” And if he were to go ahead and buy a car, then it would be up to him to bring it to a company specializing in vehicle conversions to make it handicapped accessible. In this area, Opel works with the Reha Automotive Group, which currently has ten locations throughout Germany. Most, though by no means all, dealerships also know about them. 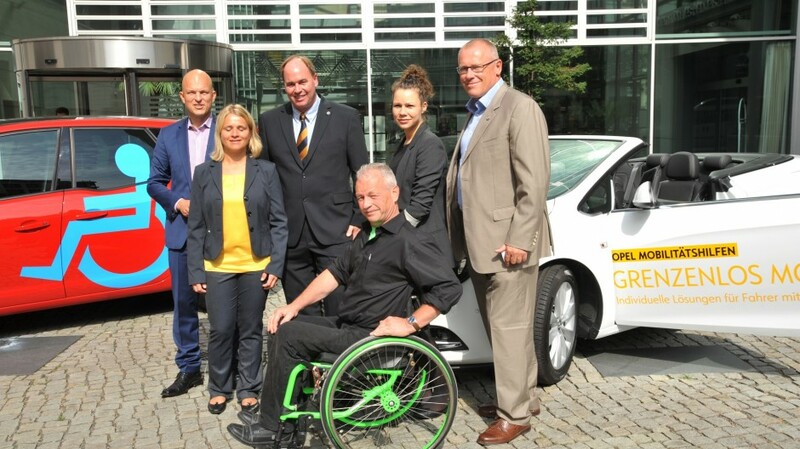 In recent years, Reimer Völz has repeatedly pushed for his company to offer more services for handicapped Opel customers. His efforts were met with a mixed reception. But last year he finally made a breakthrough. During a presentation of the Insignia Country Tourer, he had the opportunity to chat with Karl-Thomas Neumann. “I think we need to offer people in wheelchairs at the very least certain basic options when the cars leaves the plant,” he told the Opel Group CEO. The latter took up the idea and worked with Chief Marketing Officer Tina Müller to make this happen. 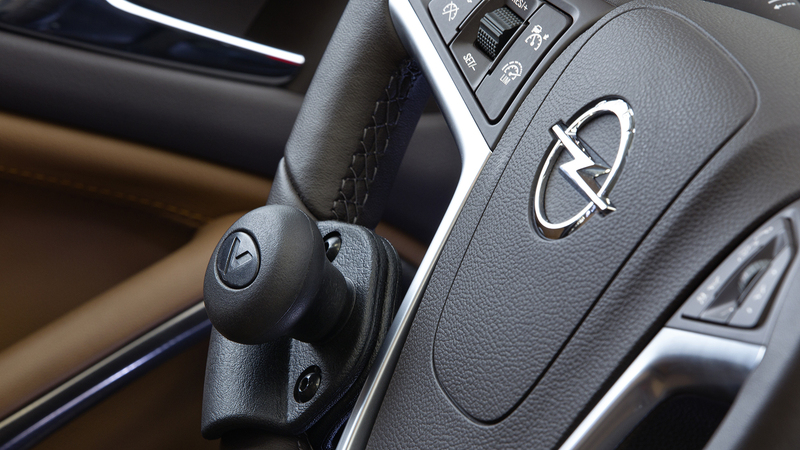 Vehicle modification: A knob on the steering wheel allows an Opel to be steered with just the left hand. And his efforts have paid off. 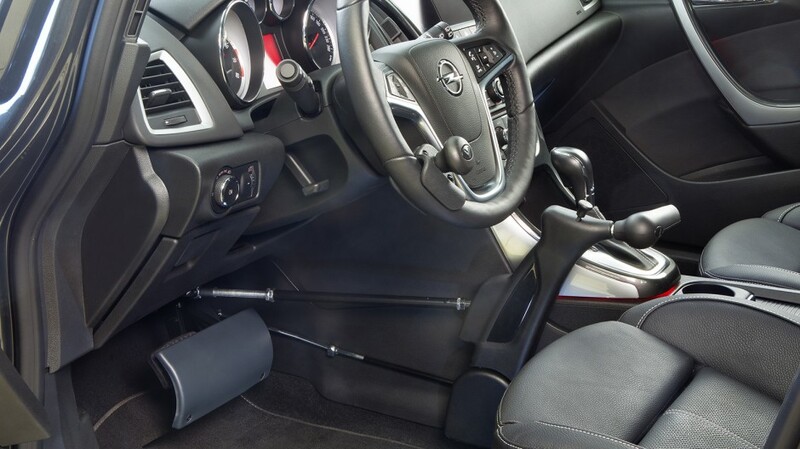 For six months now, Opel has been offering mobility aids for Astra and Cascada cars equipped with an automatic transmission. These can be ordered as special options using the Opel configurator. Opel Special Vehicles (OSV) installs a manually-operated control that allows the driver to press the accelerator and apply the brakes with his right hand, while a knob on the steering wheel can be used to steer the car using his left hand. A pedal cover is also included. All efforts are made while performing the modifications to ensure that the airbag continues to work flawlessly. Brake power and the ABS system remain likewise unaffected. Another practical benefit is that other non-disabled drivers only have to make a few simple adjustments and they can also use the car themselves. “It is now possible to order a car from an Opel dealer that is handicapped accessible and is covered by a full manufacturer’s warranty,” Reimer Völz explains. “You can pick up the car and drive it off the lot yourself.” This may sound like the type of service you would expect. But for disabled people it represents a quantum leap forward. And that’s not all: Buyers who need additional modifications to be made, like a wheelchair ramp or other systems that help them get in and out of the vehicle, can request a personal consultation with a specialist from the Reha Group at an Opel dealership before buying the car. The vehicle ordered with the special equipment installed by OSV is next transported to the nearest branch of the partner company in order for the extras to be incorporated into the car. It is then delivered, fully ready to drive, to the Opel dealership. To demonstrate the special equipment at trade shows and presentations, or when preparing promotional material, OSV made the conscious decision to use an Opel Cascada. This model like none other conveys a sense of “pure joy and excitement.” Reimer Völz is particularly pleased about this. “We are signaling a transformation in thinking – a ‘Re-Park in Your Head,’” he explains. “Many people continue to have misconceptions about the life and needs of disabled persons. We enjoy our lives as much as anyone else does – and we can certainly get excited about a car like the Cascada.” Recently, a Cascada also pulled up at the panel discussion “Re-Park in Your Head – Inclusion, Not Exclusion” hosted by Opel at its Berlin offices. Members of the panel included Verena Bentele, the Federal Government Commissioner for Matters Relating to Disabled Persons, and Gustav Pruß, managing director of the German Association of Certified Disability Managers. 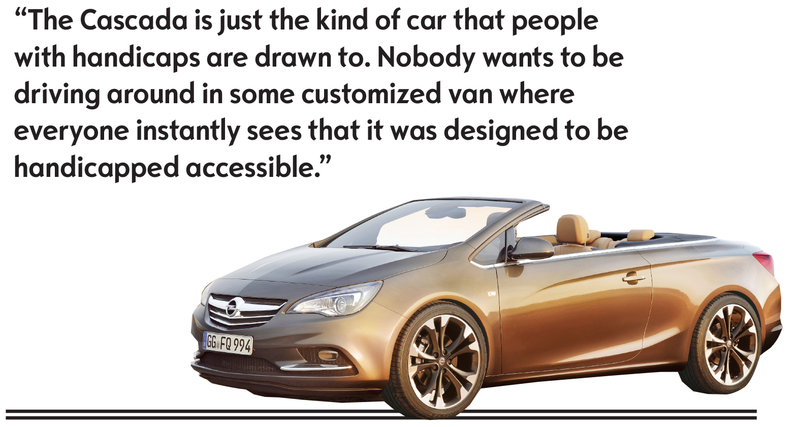 “Handicap,” Germany’s leading magazine for people with disabilities, recently devoted a seven-page feature to the Cascada. Requests have since come in from neighboring countries about the new Opel with the special mobility equipment. As you can see, while change is taking place, much remains to be done. 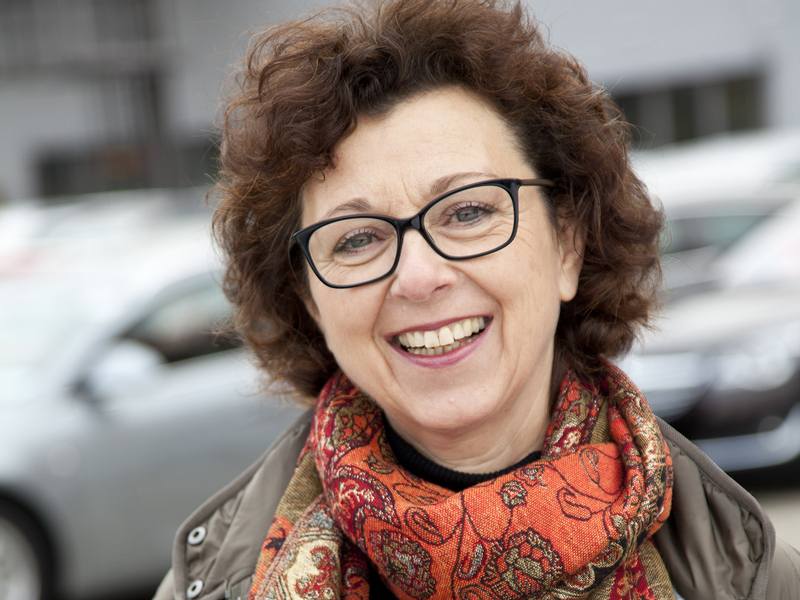 “We have to do a better job of promoting the new services available for disabled people,” OSV Marketing Manager Ilona Köhler explains, “both to customers and to our dealers.” A working group on mobility has recently begun to meet regularly at Opel with the task of developing new concepts along these lines. Reimer Völz is there as a technical advisor at all times. He combines the knowledge of an automotive specialist with the experience of being disabled himself. This makes his views opinions absolutely indispensable for OSV. Völz, 57, oversees his department’s fleet of 18 cars, including several classic Opel models. In most of them, he personally installed the mobility aids. He would never give his blessing to possible new features or equipment without having put them through their paces himself. “In this area,” he assures us, “no one can pull anything over on me.” In the Advanced Engineering department, Reimer Völz is also responsible for innovations in vehicle seats.